Setu 🌉 सेतुISSN 2475-1359* Bilingual journal published from Pittsburgh, USA :: पिट्सबर्ग अमेरिका से प्रकाशित द्वैभाषिक * 2017 - Benvenuti su lidiachiarelli! Images from "Sunset in a Cup"
Contribution à "Pan des Muses"
Poesia per Guido Chiarelli, Premio "Il Meleto di Guido Gozzano"
Lidia Chiarelli is an eminent and dynamic artist and poet of our time. She has authored poetry books, anthologies and is one of the founders of the artistic literary movement, Immagine and Poesia. She is also an award winning poet of various Italian poetry contests, Pushcart Prize nominee and a judge in poetry competitions and Art festivals. Here goes an interview with an inspirational author and artist from the lovely Mediterranean country, Italy. 1. Born and brought up in Italy, the land playing a crucial role in the fields of Art(s) and Literature, Please tell us about your background and actual life? Being born in Italy, being surrounded by various forms of Art and Poetry has certainly developed my love for both. During my university studies however I turned my interest to English and American Literature and Art. As a teacher of English I taught creative writing courses. In my workshops I led my students to transform their emotions into short poems and – with the help of an art teacher – into images too. Today I am operating in my Immagine & Poesia association working mostly on line, coordinating the work of hundreds of poets and artists from different countries, creating exhibitions, helping organize poetry competitions. 2. You are both an artist and a poet , which of those creative disciplines came first in your life? Poetry. My first encounter with poetry dates back to the 70s when I went to London for an English summer course for foreign students. One of the teachers suggested a kind of Poetry Competition and my poem “Rhythm of Life” was very successful. source of initial inspiration ) ? I started as a translator of English poems into Italian, then, remembering the successful London experience, I tried to write poems myself. 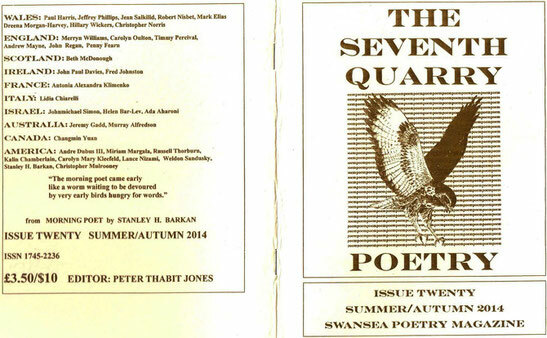 Some American friends, including editor-publisher Stanley Barkan of Cross-Cultural Communications, suggested to go on and to publish my first twenty poems. In my début collection of poems Immagine & Poesia – The Movement in Progress a few artists completed my poems with their artworks. The image of my installation Poetry Tree was the conclusion of the book. Poetry is emotion recollected in tranquillity, this sentence by William Wordsworth is the key that prompts me to write poems. My poems are usually inspired by nature in its different aspects, but also by urban views, the same perspectives that had attracted the attention of Allen Ginsberg in his poem Supermarket in California. Poetry is usually the scource of inspiration of my visual art: I create artworks starting from poems by famous authors and – recently – from my poems too. My second book Sunset in cup is a poetic sylloge that pays homage to 12 women writers of English or American literature dear to me: from Virginia Woolf to Emily Dickinson, from Christina Rossetti to Katherine Mandfield. By each of them I was inspired both for my poems and for my digital collages. 6. What are the sequences involved in your writing of a poem and your working on a painting respectively? Still referring to my latest artistic-literary production Sunset in a cup, I began studying the biography of the writer in order to deepen her knowledge and to get in tune with her: in some cases it was a sentence or a phrase in particular to arouse my inspiration. After writing the poems, I tried to turn words into images and I created the digital collages. 7. You are one of the editors of the online anthology, Immagine and poesia, published annually. Please tell us about it and your other works (poetry books and paintings)? Since the inception of the Movement Immagine & Poesia (Torino Italy, 2007) I have tried to put into practice the principles of our Manifesto and through the web I have encouraged Poets and Artists around the world to join us with their works. To date with the help of Canadian editor-poet-artist Huguette Bertrand, an anthology has been published annually for 4 years: Lawrence Ferlinghetti, icon of the American Beat Generation, has been one of the contributors in the issues of 2016 and 2017. 8. What impact does the fusion of Poetry and Art have on the human mind, soul and society as a whole? Beauty will save the world, says Prince Miškin in a famous novel by Dostoevskij. Well, I think that these words can be true in the difficult times we are experiencing: the Beauty of Poetry and Art can help us to build a better world. 9. What type of poet and artist would you best describe yourself, the versatile one, the feminist or any other particular type? I think of myself as a versatile poet-artist, I am particularly eclectic as an artist: my works range from installations, to paintings to digital collages. 10. How can both Poetry and Art be used for the betterment of humankind? One of the points of our Manifesto says that the inter-action of Poets and Artists can improve the understanding and the respect of the others. And I do believe in this principle as the Poets and the Artists of Immagine & Poesia come from different geographical areas and cultural backgrounds and they all work for the same aim; they cooperate with reciprocal esteem and respect. 11. What advise would you give to young and emerging poets and artists? As to Poetry I should say: read poetry, choose your favourite writers and build a list of mentors. Get inspired by the environment or by the persons you know. Use concrete imagery. Let me quote Wordsworth again when he writes that "all good poetry is the spontaneous overflow of powerful feelings" . Similar passages for Art: study Art Movements, start with an ideological basis and then select the best medium for illustrating that point. Every year we take part to World Peace Day (September 21) with an installation with poems and little artworks on cardboards coming from different countries: our Peace Tree is a real symbol of Peace. And the Poets and Artists of Immagine & Poesia really seem to put these words into practice. 1. When did you first start writing poems? My first encounter with poetry was back in the early '70s, when I went to London for an English summer course for foreign students. One of the teachers suggested a small poetry competition: we had to extemporize some poetic verses, and my poem "Rhythm of Life" was ranked among the best. Later, as a teacher myself, I taught creative writing courses. In my workshops I led my students to transform their emotions into short poems and - with the help of an art teacher - even into images. 2. Who inspired your early work? My first poems were inspired by nature in all its aspects, wild and beautiful, but also by urban views, the same images, the same perspectives that had attracted the attention of Allen Ginsberg. His poem, Supermarket in California has appealed to me since the very first time I read it. 3. Also you are an artist. Is there a link between both your poetry and your art? Poetry and visual art, in my case, proceed on parallel tracks. Today I mainly try to put into practice the principle enunciated by Aeronwy Thomas: "Artists and poets can experience moments of cross-fertilization," and I often look for inspiration at images of fine art photos or of paintings created by other artists or vice-versa. Sometimes the words of poets lead me to put on canvas the emotions they have called forth in me. 4 . Can you tell us about the founding of Immagine & Poesia, your wonderful poetry and art organization, and your aims for it ? Immagine & Poesia is a dream come true. It all started from a meeting with British poet Aeronwy Thomas during her visit to our school in Turin in 2006. She discussed "cross fertilization" between poets and artists, and this was the first step to the enthusiastic project of founding an artistic-literary Movement. Within one year, we had a “Manifesto” and the official presentation of Immagine & Poesia at Teatro Alfa of Torino. Then a substantial encouragement to continue on this path came from the members of what I consider ‘’my American family” the artists of New York: Adel Gorgy and Marsha Solomon, Mary Gorgy, writer and journalist, and my American publisher Stanley H . Barkan. Recently artist and poet Caroline Mary Kleefeld from Big Sur, California, and Johnmichael Simon and Helen Bar-Lev, publishers of Cyclamens and Swords in Israel, have given their valuable support to the Movement. Today, through the web, Immagine & Poesia has spread around the world and is known and loved by hundreds of artists and poets. We, the artists and poets of Immagine & Poesia, are convinced that Art and Poetry can bring together people of different cultures, nationalities, and religions and lead them to cooperate with reciprocal esteem and respect. And we hope, in the near future, to achieve a movement that more and more leads people to be mutually appreciative and tolerant through the channels of the written word and visual images. 5 . 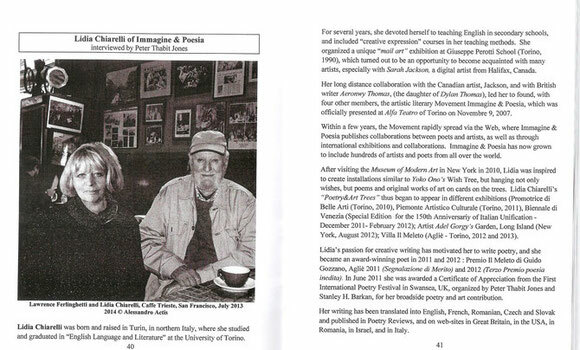 You collaborated with several artists in your latest book Immagine & Poesia – The Movement in Progress. Did you enjoy the experience ? My début book Immagine & Poesia - The Movement in Progress can be defined as a compendium of, as the Movement suggests, poems inspired by artworks and images by painters or photographers who have drawn their inspiration from my words. It has been a completely satisfying experience that demonstrates how valid and well-founded are the principles stated in our Manifesto. 6 . Your husband is an artist and your son is a photographer . What is it like being longer available to creative family and you comment on each other 's work ? We are a creative family and it is wonderful to share the love of poetry and art. 7. What are your future plans for your poetry? Another book? The American poet, Lawrence Ferlinghetti, whom I had the honor of meeting in San Francisco last summer, had words of appreciation for my book and for the project we are pursuing. Many artists and poets have written to me to let me know they are interested in participating with their works in the event of future publications. 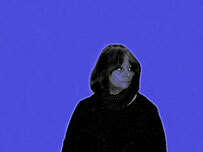 And, in the meantime, our activity of publishing collaborations between artists and poets continues on the web. Maristella Angeli: Molte importanti esperienze nella tua vita, tra le tante, quale ricordi con maggiore emozione? Lidia Chiarelli: Certamente l’incontro con il poeta-vate della Beat Generation americana Lawrence Ferlinghetti a San Francisco nel 2013. Una grande emozione e anche un incoraggiamento per le sue parole di stima per quanto stavamo organizzando sul web. M.A. : Hai iniziato la tua attività a Torino, dopo esserti laureata in Lingue e Letterature straniere, hai tenuto corsi di Scrittura creativa. Questa esperienza è stata incisiva? L.C. : Come insegnante di lingua inglese ho organizzato nella mia scuola corsi di scrittura creativa con la guida a distanza di Aeronwy Thomas, figlia del grande poeta Dylan Thomas, e dell’artista canadese Sarah Jackson: i nostri allievi hanno così imparato ad esprimere le loro emozioni prendendo ad esempio le brevi composizioni poetiche che Aeronwy man mano ci mandava. Successivamente con l’aiuto dell’insegnante di Arte completavano i loro elaborati con disegni. In altre occasioni erano invece le opere digitali di Sarah Jackson ad ispirare la loro fantasia sia nella scrittura sia nell’espressione artistica. I risultati, davvero incoraggianti per alunni di una scuola media, venivano pubblicati sul giornalino scolastico. A questo progetto è stato conferito il Premio Label Europeo 2003. M.A. : Le tue poesie hanno ottenuto importanti riconoscimenti, tradotte e pubblicate in diverse lingue straniere. Com’è maturato e si è arricchito il tuo percorso poetico? L.C. : Dopo qualche sporadico inizio ai tempi dei miei studi universitari, sono tornata più tardi alla poesia, prima come traduttrice ufficiale delle poesie di Aeronwy Thomas, poi come autrice io stessa di composizioni poetiche. L’incontro sul web di poeti di diverse nazionalità ha portato ad uno scambio di traduzioni passando per la lingua inglese di conseguenza alla pubblicazione su varie riviste letterarie. M.A. : Hai anche creato installazioni e dipinti. Come nascono le tue opere artistiche? L.C. : Durante una visita al MoMA di New York nel 2010 sono stata colpita dall’installazione Wish Tree di Yoko Ono nel giardino denominato Sculpture Garden: ho così pensato di riproporre simili installazioni anche da noi, chiedendo però ai visitatori di realizzare disegni o piccole opere artistiche da appendere ai rami, al posto di frasi o desideri. Particolare successo hanno avuto l’installazione Only for your Eyes, esposta alla Promotrice di Belle Arti di Torino nel 2014 (in occasione della mostra parallela Sguardi d’Artista di mio marito Gianpiero Actis) e gli Alberi della Pace che allestiamo annualmente ad Agliè, il paese del poeta Guido Gozzano. Di recente mi dedico anche ai collages digitali che sono presenti nella mia ultima pubblicazione bilingue di poesie e immagini Tramonto in una tazza – Sunset in a cup. M.A. : Tu sei ideologa e coordinatrice del Movimento artistico-letterario Immagine &Poesia. Come e quando è nato il Movimento? Quali sono i principi essenziali, sul quale esso si fonda? L.C. : Il Movimento è stato fondato nel 2007 in seguito ad una affermazione di Aeronwy Thomas che, durante una sua visita a Torino, teorizzò che “L’arte figurativa e la poesia possono portare a momenti di creatività incrociata”. Da qui l’idea di riunire artisti e poeti che potessero trarre reciprocamente ispirazione e spunti per le loro produzioni. Alla base del Movimento Immagine & Poesia esiste un Manifesto che essenzialmente propone l’integrazione di forme espressive diverse al fine di ottenere come risultato una nuova forma d’arte ricca e completa. M.A. : Leggo sul “Manifesto” del Movimento artistico – letterario, al punto 9: “Vogliamo combattere l’apatia, la banalità e la superficialità per affermare l’attività, l’inventiva, l’originalità, la ricerca.” Avete raggiunto gli obiettivi prefissati? L.C. : Viviamo in tempi difficili, in questi dieci anni molte cose sono cambiate, ma vogliamo fare nostra frase che Dostoevskij fa pronunciare al principe Myškin: La bellezza salverà il mondo. Invitare artisti e poeti a risvegliare la loro creatività e a creare qualcosa di bello è sempre stato e sempre sarà il nostro obiettivo e i risultati si possono vedere negli E-books pubblicati a partire dal 2014 con l’aiuto della scrittrice ed editrice canadese Huguette Bertrand. M.A. : Quanto ha inciso quella che tu definisci “Famiglia americana”? L.C. : Sono stata ospite a Long Island dell’artista Adel Gorgy e di sua moglie, Mary Gregory, critica d’arte, dopo una lunga amicizia nata e maturata sul web. É stato un momento molto costruttivo, un incontro per me decisivo: tre giorni passati a parlare di Arte, nelle sue diverse forme, e di Poesia. Sono stati loro ad incoraggiarmi ad evolvere la mia attività da traduttrice ad autrice. M.A. : Ho ascoltato brani musicali nel sito dedicato al Movimento artistico-letterario “Immagine & Poesia”. Anche la musica e le altre espressioni artistiche, possono interagire? L.C. : Certamente è questa l’evoluzione che il nostro Movimento si propone. Il cantautore inglese Gavin Adam Wood ha composto la canzone ufficiale del Movimento “Until the stars fall”. Successivamente altri musicisti ci hanno inviato le loro composizioni per accompagnare opere figurative. M.A. : Progetti per il 2018? L.C. : Continuare a fare incontrare poeti e artisti di nazioni e culture diverse con la pubblicazione dell’ E-Book 2018 di Immagine & Poesia.